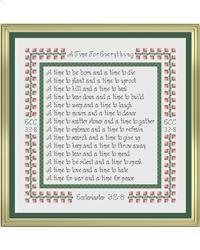 A Time for Everything, Ecclesiastes 3: 2-8 - An Original Cross Stitch Design, Pattern, Chart by CrossStitchCards. I was inspired to create this chart after browsing through my Bible. This is your time to Cross Stitch! The chart and measurements have been calculated for stitching on 14 count aida or 28 count evenweave fabric. This chart contains full stitches, and backstitch. Suitable for the more competent stitcher, as the backstitch letters might be a bit tricky. The finished design will measure approximately 11" x 11". Fabric size needed is 17" x 17". This leaves plenty of excess for framing or creating something out of your finished piece. You can, of course, use a different count of fabric, so your finished size will be different. Note about Copyright: I am honoured that you want to stitch my design. However, this design is my own and should be respected as such. It is for personal use only. Reproduction or distribution of this pattern in any form is strictly prohibited. If you wish to share your finished work in a public medium, please credit the design to CrossStitchCards.